The babies and toddlers are well looked after by exceptionally dedicated staff. Their room is downstairs room which provides light and bright surroundings for them and they have an adjacent, separate sleeping room. Sleeps and feeding patterns are followed as much as possible from their home environment. We do provide the option of pureed meals from 6 months before that time we ask for all feeds to be provided. All the under 2’s have a daily diary sheet which is a record of sleeps, nappy change and feed times. Parents can read and provide any additional daily information in these books. We plan the day guided by the Early Years Foundation Stage as above, providing a high level of stimulating, fun, sensory activities, we encourage the babies to explore natural and man- made resources, we paint and play with gloop, we develop co- ordination skills like block building and using traditional nursery rhymes, simple action songs along with musical instruments to develop language skills. We have our own outside play area where the children can be in the fresh air for most of the day and we take the Nuthatches for pram walks to the farm, Hucklesbrook stream and out into the forest which they love. The main difference between Nuthatches and Kingfishers is that they are walking, becoming more confident and independent. They like to spend time playing with the older children both indoors and outdoors, and joining in with some of their activities. This helps them to further develop their own self confidence. At meal times, by now pureed food is has been replaced by fork mashed food and when ready they sit at the specially provided low tables and chairs in the lunch room with the older children to eat. The Key Persons continue to plan activities in the three Prime Areas with a wide variety of planned activities and accessible resources for the children to make own choices, developing sharing skills, their language is further developed through books and traditional rhymes and songs. Small world & Role play all important in the development of Language and Communication, and Craft activities where lots of mess and fun all take place. All these activities are key to their Personal, Social and Emotional development. During the transition period between Nuthatches and Kingfishers the key worker will provide a busy day sheet, similar to the daily diary book. It is also at this time when the practitioners will complete each child’s 2 year check, a copy of this will be given to you to share with your Health Visitor and any other setting your child attends. 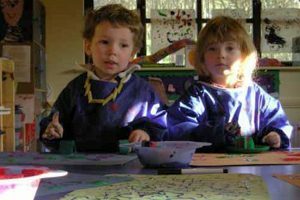 With a key focus to outdoor play, the children will spend most of the day outside in the garden, field or the forest where all of these activities will take place outside on a much bigger scale, using chunky chalk, large brushes etc. for mark making. 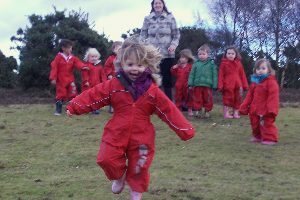 Balance beams and climbing frames, bikes, ball games, parachute games, field games and forest walks which are important for Physical development. With Robins we are continuing to develop from Kingfishers, practitioners follow their individual interests and begin to incorporate the Specific areas of learning. At this age the children are becoming more independent in their personal and development, which we encourage through self-dressing eg; putting on coats, boots etc., to go outside, self-serving during snack. They also begin to make choices in their social groups. With all the groups we base our learning through play, spending most of our day outside for our daily activities. We have a high standard of equipment which helps to develop language, early concepts of number, colour and shape. 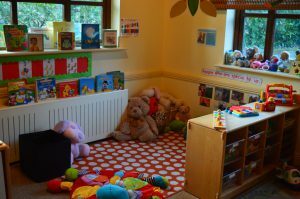 There are role play areas for dressing up and cosy corners for quieter activities such as stories and games to encourage concentration and imagination. We celebrate festivals, and invite people from the community around us to share their expertise, along with our dual language parents, who are coming in to share their language with us. The Key Person of each child will follow the individual child’s development and interest, using this to inform their planning. Our daily routine offers a fun filled day where children make full use of our facilities both indoor and out in our free flow environment. There will be a quieter resting period for children who still need a sleep or just time to rest. We are now able to offer 15 hours of flexible term time grant funding for some two year olds. Children move to the Woodpeckers the September after their 3rd birthday. They will then be in a group of children due to start school the following September. At the Coach House our planning, which is based on the children’s interests, covers the following areas from the new Early Years Foundation stage curriculum. 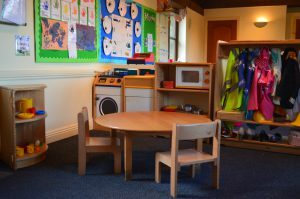 As with the groups above we provide a play based learning environment providing a balance of Adult led and Child initiated play with continuous provisions available to encourage children to make choices. Through, craft, music, woodwork, role-play, physical exercise, stories/rhymes, nature and basic science activities along with our Forest Schools activity days, your child will be introduced to all seven areas of learning, giving them broadly-based and enjoyable experiences. As we prepare the children to move on to school for their last year of Early Years Provision we have visits to and from the local schools to meet their new reception class teachers. 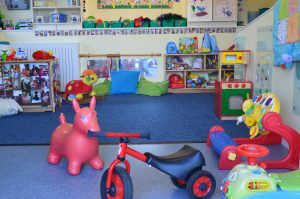 We are members of the National Day Nursery Association and receive support from the Early Years Advisory Teacher from Hampshire. Parents can engage in the delivery of improved outcomes for their child by completing The Coach House Day Nursery’s record of development form which is sent out regularly by email.